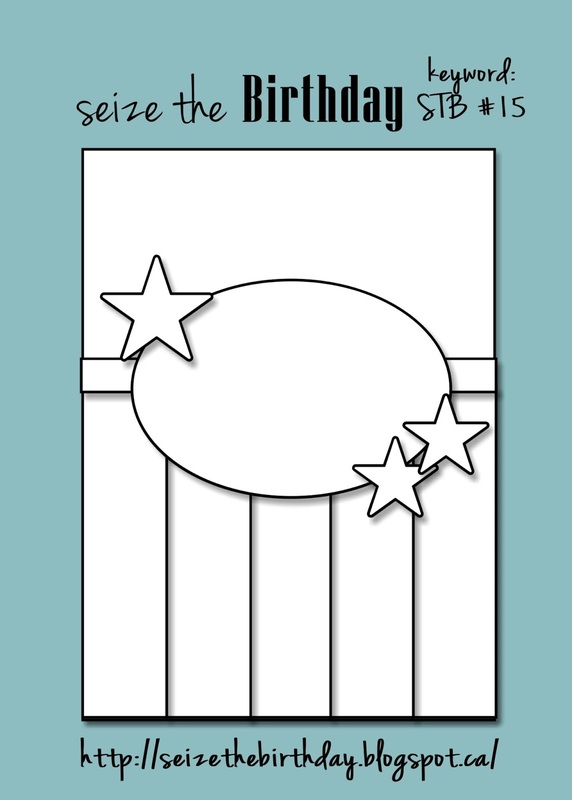 This card is for Seize the Birthday #15-masculine challenge. So far I have participated in a few of the masculine challenges, but have failed to do any of the female ones. I must make it a point to do that! I will probably have a good chance, because STB is switching over to a two week challenge format. Since this was a masculine challenge, I went for one of the most manly paper packs I own....Well Worn. The color palette is mostly rusts, blues and browns. I was going in a totally different direction, as far a color goes, until I spotted this patterned paper. I had never really seen it before.....how could that be? It's really different from any other design in that bunch and I was drawn to it. I pulled out the colors from it--Early Espresso, Black, Vanilla and River Rock. Ahhhh, River Rock. I used to really, really dislike River Rock. Then I made this card and it made me see River Rock in a totally new light. From that time on I had a different relationship with River Rock. I actually came to love it. But, now it's retiring and I'm really gonna miss it! I like the way it's kinda green and kinda tan all at once. Farewell, River Rock. You must go so there can be room for a much more hip shade of gray. Ok...enough nostalgia, let's get back to the task at hand. After I had my paper in place, I tried to go for a masculine stamp set. I decided I wanted a sentiment as the focal point of the card, so I went for Daring Adventure. This could be turned into a graduation card too. I stamped the sentiment onto a framelit oval and embossed it with Early Espresso EP. I added some River Rock splotches from French Foliage and then very, very lightly sponged on some black ink to mimic the background of the DP. Next, I added all the chotchkies, which are what make a card special, I think. I stamped the typed words from the Daring Adventure set in River Rock and punch it out with the Postage Stamp punch. I added the footprints in black and sponged on some black ink too. Wooden buttons, a library clip holding some linen thread complete this card. So much for the sad, now onto the happy! This week was fellow designer Vicki Burdick's birthday. Lesley has set up a linky for us to link up birthday cards for Vicki. 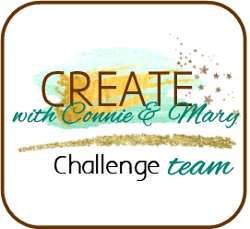 Our design team desided to make all of our challenge cards for dear Vicki. 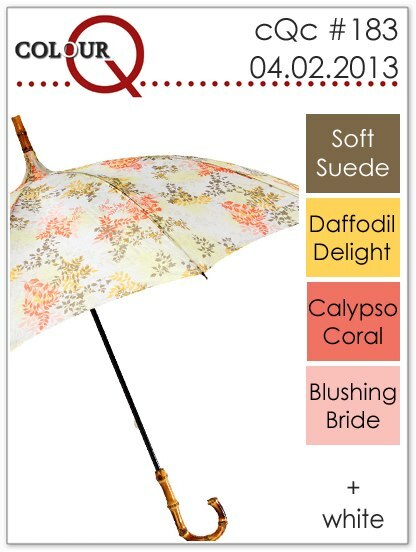 The colors this week are Blushing Bride and Calypso Coral. I also used the sketch from Mojo Monday 290. I chose to go with one of my new stamp sets, Postage Due. I love the vintage feel of the stamp set. I used the punched postage stamps for the four squares and the flower/script/bike image for my bottom panel. I stamped most everything in Blushing Bride, mainly because I don't own any cardstock in that color. I will need to purchase some now that it is being introduced into the subtles family. I sponged everything with Crumb Cake to antique it. I also embossed the bottom panel with my Vintage Wallpaper EF, for more antique feel. A little natural trim, Calypso Coral organdy ribbon, a brad and some pearls and this card was finished off. For one last time, check out my fellow designers blogs.....they are all amazing!!!! 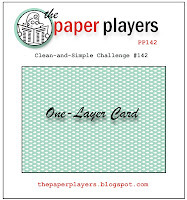 This card is for The Paper Players clean and simple one layer card. Eeeek! 1: clean and simple is not my thing. 2: one layer is not my thing. I really wanted to participate in this challenge to push myself! I played off of a scrap page from Bobbie Trost that I thought was amazing. She used punched butterflies on her page, but I couldn't so I chose one of the butterflies from the Best of Butterflies set I just purchased. Now, this is by far NOT my favorite butterfly in the bunch, but it's the smallest and best for the look I wanted to achieve. I went through many-a-white pieces trying to get the flow of the butterflies just right. This is probably the fifth or sixth incarnation of this card. After I got the butterflies to the point where I was satisfied (notice I didn't say happy) with them, I added the sentiment. I figured this one went along with the butterfly theme, and I could also use it for a graduation card if I have to. (You know, spread your wings and take flight, you've got your whole life ahead of you, type of feeling.....that fits into graduation, right???) Here's the kicker. After I stamped the sentiment, I SMEARED IT! Ahhhhhhh! I was so upset, but it was too late to go back now. Under normal circumstances I would re-stamp it onto scrap paper, punch it out and adhere it over the original image....not this time. Not in a one layer challenge. Oh well, I guess it's not too noticable. To finish this baby off I ran it throught the tulip border EF and added some lines above and below the sentiment with my score tool. Lastly, I dotted a few of the butterflies with bling. Whew, now that was a challenge for me! Give me layers any day!!!! I also used the sketch from Try Stampin' on Tuesday. When I saw the inspiration card, I knew right away I'd use this image from the Word Play set. I inked it up with the colors from the inspiration card with my markers. Now that I look at it again though, I remembered that I had originly planned to use Pool Party instead of Marina Mist....whoops! I wanted to bring the black from the inspiration card in with layering. I love a pop of black against bright colors. With all the layering on this card it weighs about a pound and a half! I like the way it turned out though....very festive and fun! I added a bit of sparkle with Glimmer Brads in the opposite corners and Dazzeling Diamonds glitter on the itty bitty world. 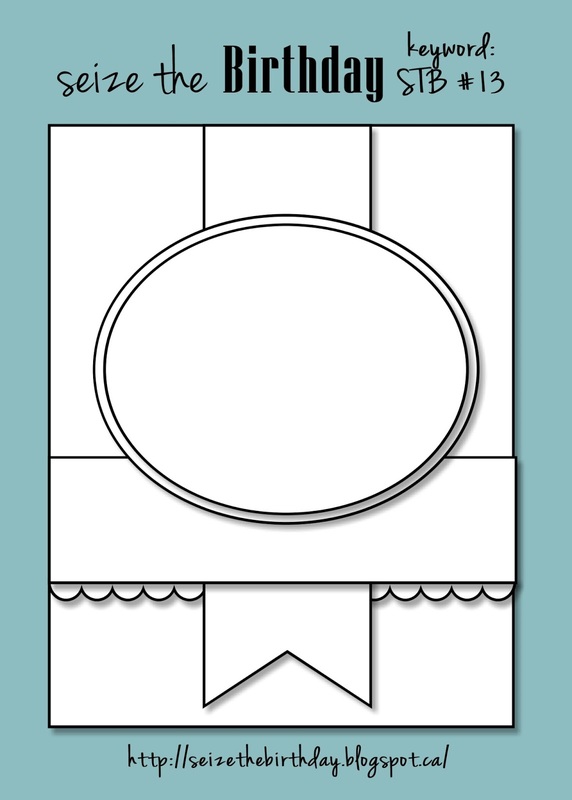 Today's card is for Pals Paper Arts 157 and Create with Connie and Mary 248. I don't think I've participated with either challenge for quite a bit, especially Pals. I flipped the sketch on it's side because I wanted to use one of my newer stamp sets, Take Care. I've been looking at it in the catalog for a while now and decided to finally get it. I stamped and cut out the little bird from Everything Eleanor and set it on the branch. I added a couple of punched flowers to the branch to bring in the Summer Starfruit color. The background is a piece of Summer Starfruit DSP that I ran through my Honeycomb EF. I added a strip of Gumball Green after I had stamped it with the nest image in Gumball Green ink. I added some Gumball ribbon and then layered a bow over some Linen Thread and another punched flower. A few pearls to dot the center of the flowers and the birds eye and this card was done! 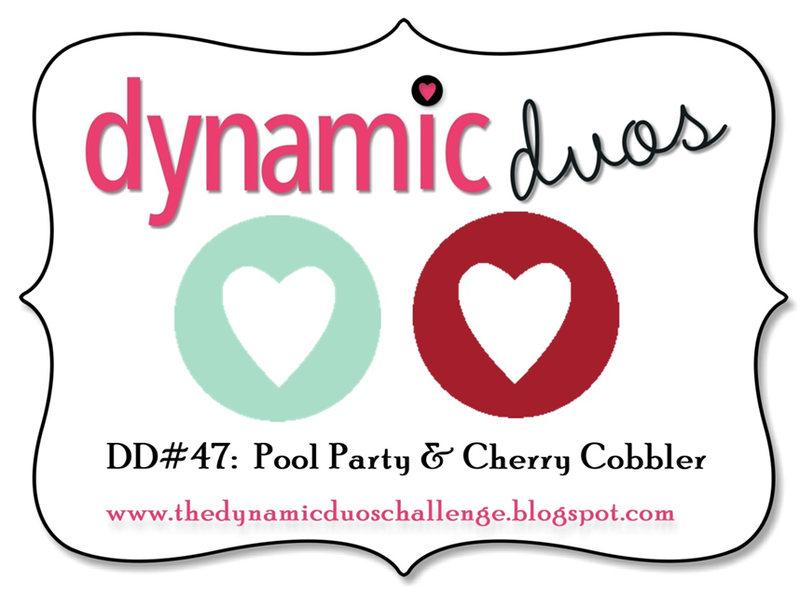 Welcome to another Dynamic Duos Saturday! 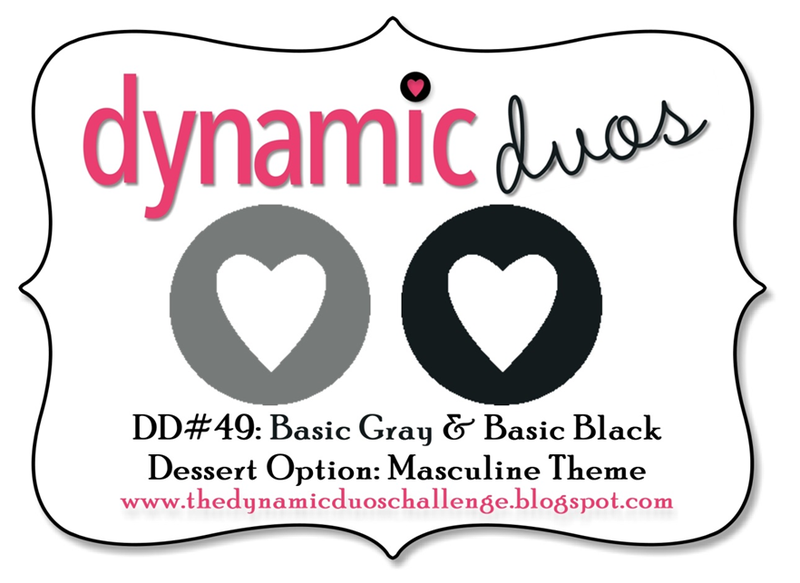 Our colors of the week are Basic Black and Basic Gray with a masculine dessert option. Whew! What a whirlwind week I've had....actually it's been about a week and a half. I've had something major going on almost everyday, which has involved alot of running around.....I'm tired people! My post is a little late today, too. That's because I didn't have time to do it last night and I slept in this morning. It felt so good! Anyway, enough about that. Let's get onto stamping!!!! Graduation season is coming up fast here in our little community and I have a several cards to make for it. This was a good color combo for a grad card, I thought. I had recently purchased the Pure Gumption set, as well as the Measuring Stick Stampin' Around Wheel, so I put them together. The card is fairly simple with litlle embelishment, but for a manly card that what you want I guess. I was trying to think of some other creative things I could do with it....maybe something different with the graduation cap, but my brain was fried this week! I guess I was sticking with the theme of "basic"! Good Saturday morning everyone! 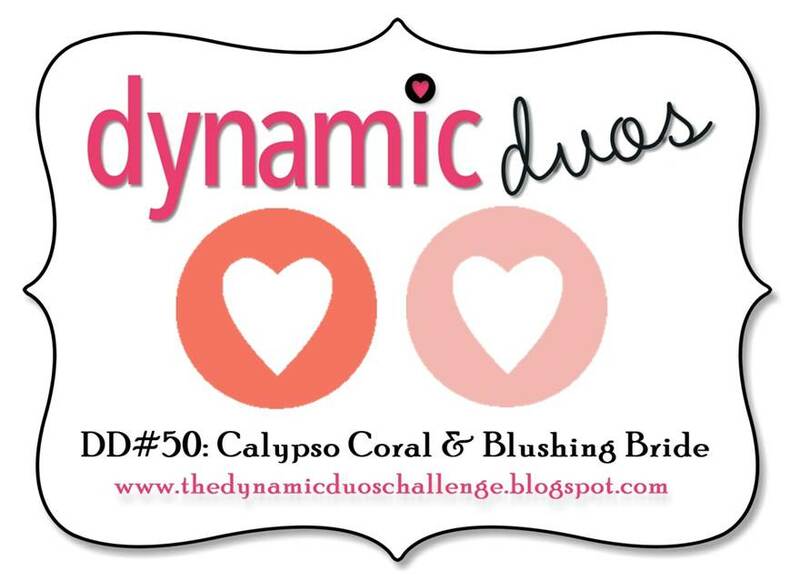 It's time for another cool color challenge from Dynamic Duos. 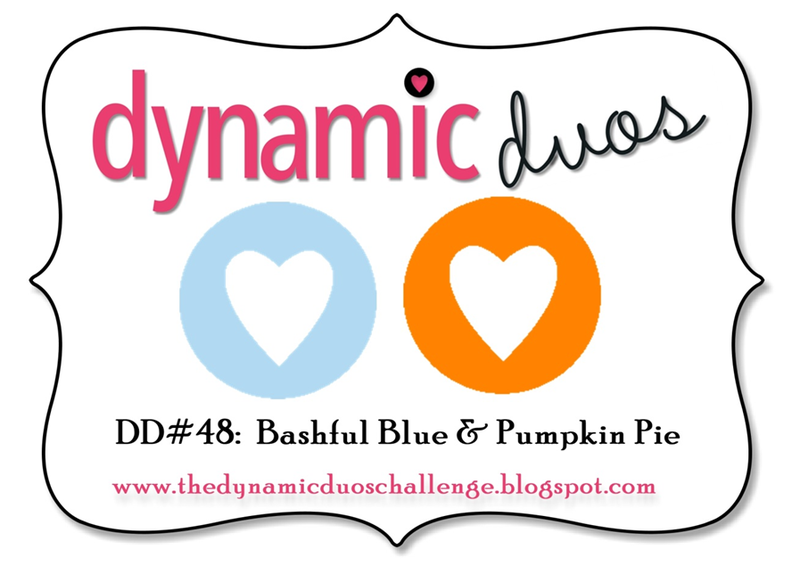 This week is a cheerful combo of Pumpkin Pie and Bashful Blue. I used Seize the Birthday #13 Masculine to help me along with my card this week. I love this sketch! This is actually made two cards for this DD challenge. The first one I made was OK, but I wasn't totally loving it. I was playing around with a few different stamps when I saw the little rocket from Pun Fun and thought it would be perfect for these colors. I stamped the rocket in Stazon Ink on watercolor paper and colored it with a blender pen and markers. I added gray as a neutral. 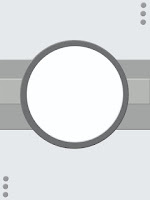 I cut the image out with oval framelits, as well as another layering piece in Bashful Blue. I used my Star #2 die and cut out a bunch of little stars. After sponging them with a little Pumpkin Pie, I adhered them to the PP base. The center banner is cut from some Just Add Cake DP and framed out with a little gray. The horizontal gray panel was run through my big shot with my industrial metal EF. A little border of Bashful Blue, another star with a glitter brad, and some glitter glue on the main image panel, and my card is complete. 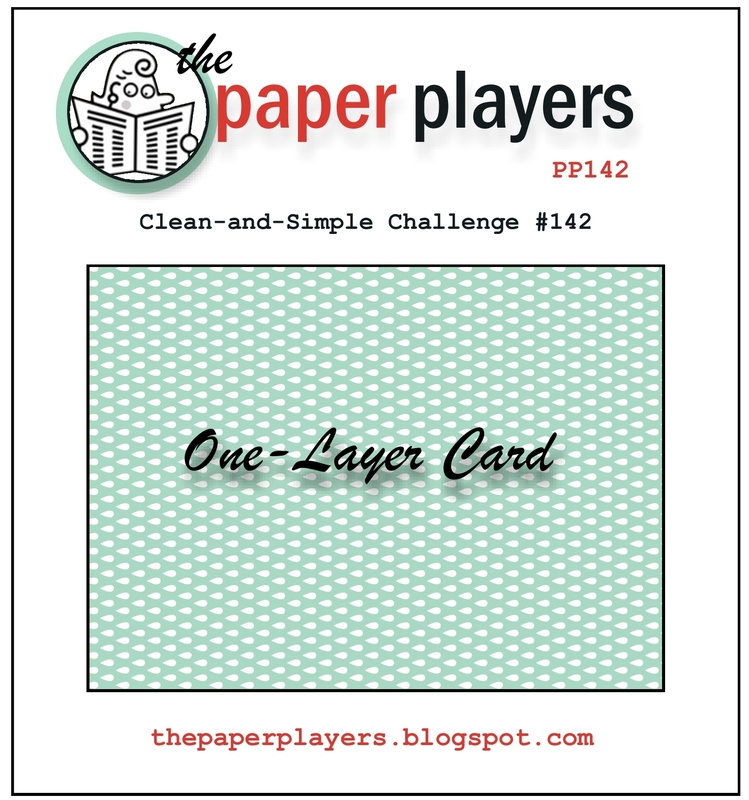 Here's the first card I made for the challenge. I think I'd have liked it better had I skipped using the square die and just gone for the circle straight away. It's cute and OK, but I like the rocket one much better! Here it is again from a different angle. As always, make sure you check out what the other Dynamic Duos Designers have done! 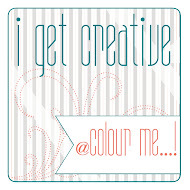 I made this card for ColourQ Challenge 183. It's a sympathy card for a friend of mine who lost her mother. I've had to make so many Sympathy card for myself and others lately. I hate to think about it, but I know people appreciate the thought and a handmade card. I still have a few more to make and I want to make sure each one is special. I loved the color combo over at CQC this week. I simply adore Calypso Coral and Blushing Bride together....it's a match made in heaven. When I first started stamping, SU had a color called Cameo Coral and I didn't care for it. Now my style and tastes have changed and I love it and the newer Calypso. Good Saturday morning everyone! 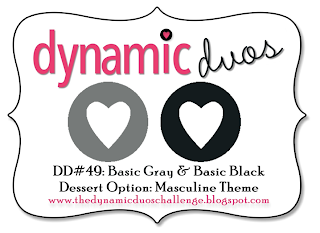 Today is Dynamic Duos Saturday and we have another fun color combo for you to play with! Pool Party and Cherry Cobbler! When I first looked it I wondered what in the world I was gonna do. I started browsing around for inspiration and came across a card in the back of the SU Catalog that I decided to use as my layout. Next, I chose the stamp to go with it. I have loved this little set called A Flower For All Seasons for ages. It has this cute, little image that is so totally spring! This was my perfect match....a little blue bird and some bright, cherry red tulips. I stamped it on a circle of watercolor paper and colored it in with my markers and blender pen. I popped it up on dimesionals and mounted the circle onto a flower die cut from Floral Frames Framelits. I cut out two tag shapes out of Pool Party cardstock, layered a peice of Pool Party DP over one and a scrap of Very Vanilla, that I ran through the Honeycomb EF, on the other. The background paper is from Festival of Prints paper pack. I finshed the card by tying the tags together with some flower buttons and linen thread. The very last thing I did was add some Crystal Effects to the tulips and birdie. It looks so cool in real life! For a color combo that I didn't think I'd like, this has turned out to be one of my most favorite cards!!!! I see that somehow when I added the Crystal Effects, it dulled the color on the little birdie....he was much brighter before. Oh well, I still love it! 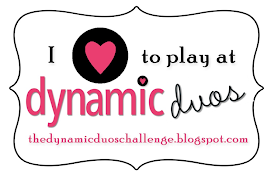 As always, make sure you check out the designs from the other talented ladies at Dynamic Duos! 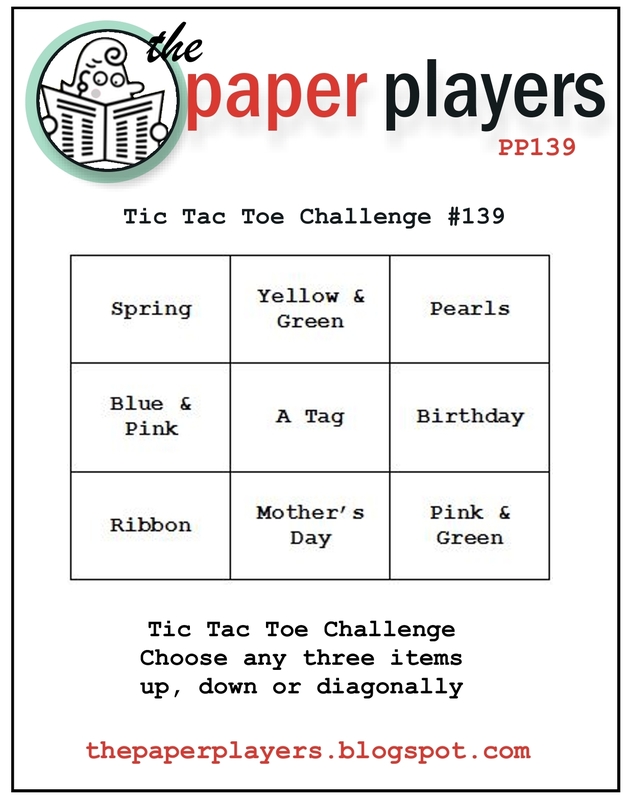 I made today's card for The Paper Players Tic Tac Toe Challenge 139. I also used the sketch from Mojo Monday 278. 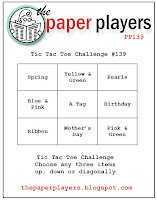 Oh, how I love the Tic Tac Toe challenges! I think they are so much fun and it's great to see the variety of things other stampers come up with! It leaves so much room for creativity. I chose to go straight across the middle. If anyone is a regular to my blog then you know that pink and blue is one of my favorite color combos, so how could I not choose it? I went for the softer, more romantic, hues this time using Marina Mist, Bashful Blue, and Blushing Bride. For the tag element I used my Lots of Tags die and then layered a banner over the top of it with the birthday greeting from On Your Birthday.